UNCOMFORTABLE MOMENTS: Just Waitin' on a Friend. Just Waitin' on a Friend. I don't know whether this represents a feline U.M., but let's anthropomorphize for a moment. Dusty seemed to be spending more time than usual sitting on the desk, looking intently outside. It soon became apparent why: Right across the window bay, no more than five feet away, was another kitty cat, sitting on a table, staring back out its window at Dusty. Th e tension was palpable. 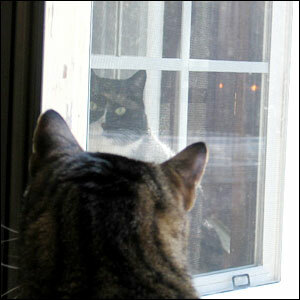 The other cat would only show half of his face in the window, using one eye to surveil his neighbor. We humans excitedly got behind Dusty and stared too, hoping no humans would show up on the other side. "Dusty! You have new friend!" we exclaimed. Dusty meowed. The other cat stayed silent and half hidden, but watchful. Days elapsed and Dusty developed what could fairly be called a fixation. Every morning he sat by the window, stock still and vigilant. Many times his new "friend" was a no-show. Dusty waited. "This might not be healthy for you," Dusty was advised. He ignored us. On the days when Mr. Big would materialize, now fully in the window at close range, Dusty would jump from the desk and onto the window sill, meowing and pawing the window pane as if to say, "I can't get this thing open right now -- but don't worry, I'm working on it." Big never moved or made a sound. Now we look for Mr. Big along with Dusty. We don't see Big's humans, and we like it that way. It keeps the relationship pure. But it's a dysfunctional relationship, and we know it. Some mornings I wake up to the sound of claws tapping on glass, as Dusty tries ever optimistically to open the window between him and the one being he identifies with in the world right now. Big remains impervious, as does the window. It's a fitting allegory, no? Maybe Dusty is planning a feline exorcism... "The power of Christ compels you -- to stop freakin' staring at me!"